The prime minister's office is praising the work of a senior RCMP officer who was recently disciplined for workplace bullying inside of Stephen Harper's security detail. The prime minister's office is praising the work of a senior RCMP officer who was recently disciplined for workplace bullying inside Stephen Harper's security detail. An internal memo sent to Conservatives by Harper's office Monday makes no mention of the measures taken by the Mounties to deal with a range of recent complaints against Supt. Bruno Saccomani that were deemed "disturbing" in an RCMP review. The email underlined that Harper and his family "have witnessed first-hand a dramatic improvement in the unit's performance, an improvement due largely to (the detail's) strong leadership in recent years." The missive urges Tories not to discuss the issue publicly. Harper's former chief of staff Guy Giorno said Tuesday that he had never seen Saccomani in conflict with those below him, but that he frequently butted heads with the upper ranks of the force as he tried to bring improvements to the protection detail. "This was a constant issue. It was clear that the higher ups didn't like the fact that he was calling attention to the needs for improvement, and they play hardball," said Giorno. But an RCMP management review report obtained by Radio-Canada said the safety of the Harpers might have been put at risk because of the tense workplace. The management review report, published in January, paints a grim picture of on-the-job morale for the 117 Mounties who protect the Harpers around the world and across Canada. "The (review) team found that the examples of conflict in the workplace, harassment, discrimination, intimidation and perceived favouritism given during the interviews were disturbing," says the report. Evaluators interviewed 41 per cent of the protection unit in December, and found a majority of officers had issues with their supervisor — Supt. Bruno Saccomani. 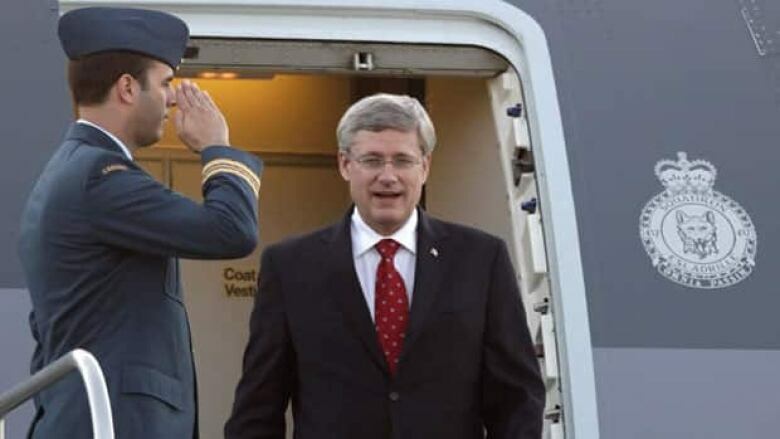 Saccomani is currently travelling with Harper in Mexico for a G20 summit. Some complained about being reprimanded in front of their peers or in public. Mounties reported they felt they were "walking on eggshells" or feared repercussions following the review. "Not being able to focus on the duties because they are anxious in the presence of the (Officer in Charge) adds risk to the safety of the prime minister, his family, others in their presence, employees and the general public," the report says. The RCMP, which has been working to deal with complaints of sexual harassment and the overall grievance process, moved swiftly on the issue. Assistant RCMP Commissioner James Malizia said an officer of equal rank was brought in to speak to staff and improve communications. A plan was then put in place to address the problems. Saccomani was assigned a mentor and a coach, and given a statement of responsibilities and expectations. Malizia noted that Saccomani went on an eight-week personal leave shortly after the review came out. Saccomani was on leave to undergo heart surgery. "Quite rightly so, the officer in charge apologized to the employees, and advised them that he was open to change and bringing positive change in the section," Malizia said in an interview. Malizia said there was no issue of sexual harassment, but more general "bullying." No officer chose to mount a formal grievance. The entire protection detail was given surveys last week to fill out to see if there had been any improvement in the situation. Public Safety Minister Vic Toews said in the Commons he was pleased with the commissioner's "proactive approach." Dimitri Soudas, Harper's former director of communications, praised Saccomani's work in the protection detail. He said Saccomani had transformed the unit from a "pre-retirement" stop to a tight-ship detail with younger, fitter officers. "Ever since Bruno arrived, he's really restructured and reformed the place to be a serious, prime ministerial, protective unit," said Soudas. "To be honest, you meet very few people in public service that apply themselves with so much dedication and professionalism in doing the job they have to do." U.S. President Barack Obama's own security detail has come under scrutiny in recent months. Eight members, including two supervisors, eventually lost their jobs in connection with the use of prostitutes and a subsequent altercation in Cartagena, Colombia in April.